Coptic Pope Tawadros II’s representative at the In Defense of Christians summit lays out what must be done to bring healing and reconciliation to end the persecutions and hatreds fueling the region’s conflicts. WASHINGTON — Egypt’s Christians bring a valuable perspective when it comes to building bridges with Muslim leaders and working for peace, reconciliation and religious equality in the Middle East. They have faced down extremist violence and worked successfully with Muslim leaders in ways that could give hope to the rest of the Middle East. Pope Tawadros II’s personal representative, Bishop Angaelos of the Coptic Orthodox Church, spoke to the Register in a wide-ranging interview after the historic inaugural summit held Sept. 9-11 in Washington. The summit was sponsored by the advocacy organization In Defense of Christians. 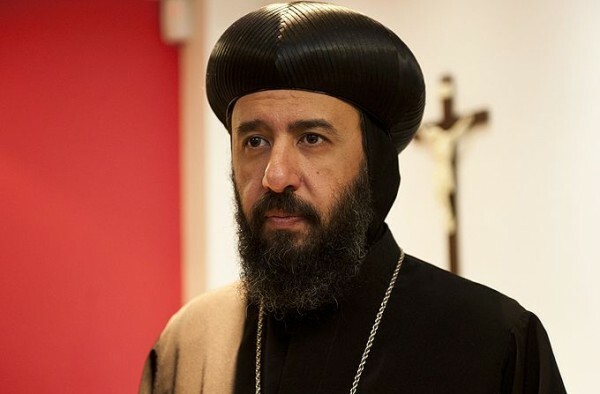 Bishop Angaelos addressed vital questions touching on the historic nature of the summit and the unprecedented display of Christian unity, the vital role of Muslim moderates and the lessons of the Coptic experience in Egypt. He also focused on President Obama’s plan for ISIS, the Christian community’s demands of the international community and why healing and reconciliation are still possible for the Middle East. What are your thoughts at the close of the In Defense of Christians summit? Are you happy with what was accomplished here? I think it was good to bring everyone together. It’s imperative that we collaborate more to work on these things. I think it is important for us to intensify all of our efforts to advocate for people who are in need anywhere in the world. Because it is essential for us to be able to do this. Do more Muslim voices need to speak out against the Islamic fundamentalists? Do we need to hear more from the Muslim moderates? I don’t use the term “moderates” or “fundamentalists.” I think we need to hear more from recognized Muslim leadership: what they view on what’s happening. Now, I’ve no doubt that the vast majority are going to say that they reject it. But that needs to be within the public sphere. Because this is a poor reflection on Muslims, more than anything else, and I think it is very unfair. The vast majority of Muslims who would completely renounce this would still be linked to this in some way. I think when you have recognized Islamic voices saying this is unacceptable, then it does two things: First of all, it creates an understanding with other Muslims that this is actually wrong, so don’t go down this road. Then, it indicates with those who are potentially now involved with these groupings that there are Muslims in the world who are saying this is wrong. You had previously mentioned at the IDC conference that poverty and illiteracy are fueling Islamist extremism. Do you think they are the main causes? What can be done? I think illiteracy and poverty are the roots of any kind of radicalization, whether it is Islamist or otherwise. I think when people are poor and ill-informed or misinformed, then they are most vulnerable. That vulnerability is then used to misrepresent others or to push them in a particular direction. How has the Christian situation in Egypt improved since the new constitution? Well, it’s not really since the constitution. Christians in Egypt still face challenges, but at least now, with a more non-Islamist government, it is important to recognize that there is not the institutional attack that there was. There’s a greater sense of national identity. Being Egyptian is no longer equated with being Muslim: You can be a Christian or Muslim and be a peaceful and productive Egyptian. To what degree is Egypt a successful model of dialogue and cooperation between the Christian community and Muslims who renounce extremism? To start, there has always been a very good relationship between the Church, through the leadership of the Church and the Pope [Tawadros II] and Al-Azhar [University in Cairo]. I think that has always been a very good combination. We don’t speak about theological dialogue, but what we do cover is ethical issues, moral issues, social issues, and you’ll find a huge amount of coming together on those fronts. Has the situation with the Islamic State group (ISIS) affected at all Islamist militancy in Egypt? I think it is all very much part of the same dynamic. Of course, it will affect, because radical Islamists in Egypt will see what is happening in Iraq as a victory. And in some way, they may, at some stage, want to replicate and implement that. Are Islamic militant groups like Hamas, the Muslim Brotherhood, the Islamic State and Boko Haram all cut from the same cloth? Do they pose the same threat to Muslims, Christians and Jews of the region? I think anything that alienates and marginalizes the vast majority of the community is a threat. They alienate and marginalize most people, including Muslims. So I think it is absolutely a threat. Has aggression from the Islamic State group impacted Muslim-Christian dialogue? I think a lot of Muslims will distance themselves from ISIS and what it stands for. So when people are still wanting to dialogue, and they do admit that this is wrong, the dialogue is part of their duties. Were you able to meet with President Obama on Sept. 11? We did meet with President Obama. It was thoughtful; it was — I felt — genuine. The president sat, listened and shared his views. I think so much has happened, especially with President Obama and people in his position, through his advisers and analysts, that I think it is sometimes very good to get the reports [directly] from people on the ground. So to hear about the plight of the Christians through Christian leaders, through the shepherds themselves on the ground, I think was very important. I think he seemed to take that on board and to absorb it and to react to it. His plan to “degrade and destroy” ISIS/ISIL involves four parts: airstrikes in Iraq and Syria; arming Kurds, Iraqis and the moderate Muslim Syrian opposition; enlisting other countries in counterterrorism operations; and providing humanitarian aid. What are your thoughts on the president’s proposals as they affect Christian concerns? I don’t want to get into military strategy, but I think the people there — and again, we’re not just talking about Christians, but Christians, Yazidis and other minorities — need to be safeguarded somehow. I’m not going to advise on how. But I think we owe them that their lives in that area should be safe and sane. Are there any broad practical solutions or proposals that the Middle-East Christian leaders have been asking the international community to work toward or implement that would stop the persecution of all religions in the region? The requests we have made are, first of all, humanitarian aid, which is immediate and very necessary; secondly, safeguarding areas for people who can continue to live their lives within their natural settings; and thirdly, if that is not possible, then providing potential avenues or ways out of the region. Some Christians have wanted to arm themselves, but the Middle-East bishops have asked them not to take up sides in the conflicts. What are your thoughts? Is it correct the Coptic Church urged Christians not to respond with violence when violence was committed against them? Well, actually, the surprising thing was that we never urged anyone to do anything. They just didn’t respond with violence. We never have as Christians in Egypt responded to this violence in contemporary history — or at all. We’ve never taken up arms; we’ve never responded violently; we’ve never had militia. We’ve never had any of that — yet we continue to be the largest Christian denomination in the Middle East. So there may be some correlation there. I think the minute you take up arms — within a setting like Egypt — you’ve condemned yourself to failure. Because then, you are fighting fire with fire, and the fire coming at you is much greater than yours. I think what [Christian] Egyptians did in not retaliating is pouring an immense amount of water on a fire that is extinguished. How historic is this level of cooperation between Catholic and Orthodox patriarchs of different rites and leaders of other Christian denominations? I think it is historic, but I think we’re in an era where it is very much needed. We have to act in that way; we have to work collaboratively. We have to work for our common interests. There is such commonality. And just seeing the patriarchs together over the past few days we understand that, in areas like Syria, Lebanon, Iraq in particular, there is such a commonality between them, whether it is linguistic, cultural or historic. So it doesn’t make sense for us to be separate tribes. How would you assess Pope Francis’ efforts to promote peace in the Middle East? I think His Holiness is a pragmatist, as one who speaks for peace. And I think he is providing inspiration. But I don’t want to take away from the patriarchs and the heads of churches who are here: They are not just here because the Pope told them to. They’re here because they are in themselves faithful shepherds, who are looking at the lives of their flocks and inspired by Pope Francis and inspired by other significant leaders and have decided to work together. Do you believe healing and reconciliation is possible in the Middle East after all of this violence? Of course it is. There are people who will take themselves out of the healing and reconciliation equation, because they just don’t want healing or reconciliation. And you can’t force them on it. If someone doesn’t want to come to the table, you can’t force him to the table. But for anyone who can or who wants to [go down] those avenues of reconciliation, they’ll respond. How can we accomplish healing and reconciliation? By ourselves as Christians, continuing to be reconciling agents; by not retaliating and using evil for evil; by being very prayerful and by being light in the midst of a lot of darkness. What can Christians over here in the West, and all people of goodwill, do to help the Christians in the Middle East in their quest to defend not only their religious freedom, but also that of Muslims, Jews and all religious sects? I think we need to live the principles that we live by here at the broader level, at the broader platform of the international community. And that is to look at equality, look at freedom of expression, conscience and religion and safeguard them for people. As Christians, first and foremost, we pray for each other and suffer with our brothers and sisters and rejoice with our brothers and sisters. Christians in the Middle East don’t want to be victims. They don’t want to be seen as victims or portrayed as victims. They want to be good and faithful stewards who are living very powerfully in the midst of a lot of conflict and a lot of hostility. Thank you so much, Your Grace, for this privilege. Do you have any final thought or comment? It has been very good to see people stand together and wanting to express their fellowship in standing with Christians. I think it is important for us as leaders, whether religious or political, to deal with situations peacefully, pragmatically, and not to use divisive or inflammatory language and undermine this collaborative work that could be very good. Peter Jesserer Smith is the Register’s Washington correspondent. Reprinted with permission from National Catholic Register.